To Cite: Heshmati S M, Ebrahimi A, Rasouli H R. Fluid Resuscitation, Which Fluid is the Best for Each Patient? A Systematic Review and Meta Analysis, Iran Red Crescent Med J. 2017 ; 19(3):e41729. doi: 10.5812/ircmj.41729. Context: Fluid therapy is the basis of resuscitation; however, there has been a heated debate on the choice of appropriate fluid. This study mainly aimed to determine which fluid is correlated with a decline in mortality rate and can be the most suitable choice for each group of patients. Evidence Acquisition: We conducted a systematic search on Google Scholar, Web of Science, Scopus, BMJ Journals, Thieme, Path Consult, BIDS Index, Embase, Medline, and Cochrane Controlled Trials up to April 2016. The relevant studies were those that provided a comparison between the effects of different fluids on the mortality rate of patients. Two independent authors participated in the evaluating methodological quality, selecting eligible studies, and extracting the relevant data from the studies. Results: We selected 26 out of 2724 potential randomized controlled trials (RCTs) from the databases for both quantitative and qualitative analyses resulting in a total of 22882 patients receiving either colloid or crystalloid fluids. The approximated pooled Relative risk (RR) for the death of patients who had been resuscitated with crystalloid fluid therapy rather than colloid fluid therapy was 1.008. This meta-analysis illustrated that there was a decline in the mortality rate with borderline significance in both traumatic and hypovolemic patients through utilizing colloid fluids. The mortality reduced more by using dextran and albumin than using crystalloid fluids. Conclusions: The results of this meta-analysis show that colloid fluids can increase the successful resuscitation rate compared to crystalloid fluids especially in traumatic and hypovolemic patients.Some of the colloids like albumin and dextran have a positive effect on reducing the mortality rate but others like Hetastarch (HES) increase the mortality rate compared to normal saline (NS). Fluid therapy is the basis of resuscitation due to sepsis, major surgery, burns, or trauma. However, some researches (1) have emphasized the need for careful consideration in the timing of volume replacement; and clinicians have various options regarding the selection of resuscitation fluid. Although some controversial evidence exists that can guide clinicians in choosing their resuscitation goals in critically ill patients, there is a lack of sufficient high-quality evidence guiding the choice of the resuscitation fluid (2). Currently, the choice is made between colloid and crystalloid solutions. Although colloid solutions are often utilized in obtaining lasting and rapid circulatory stabilization, there is a lack of enough empirical evidence to support such practice. There is a widespread use of colloids because they have been recommended in certain intensive care management algorithms and resuscitation guidelines (1). According to the recommendations by the US hospital consortium guidelines, colloids are employed in non-hemorrhagic shock after an infusion of crystalloid and in hemorrhagic shock up to the time when blood products will be available (2). However, a survey conducted by the US academic health centers in 1995 revealed that the application of colloids exceeded the recommendations of the hospital consortium (2). While the results obtained from the evaluation study of albumin versus saline fluid revealed no significant disparity in the mortality of a heterogeneous patient’s population receiving resuscitation within the intensive care unit (ICU) department, an evaluation of a pre-specified subgroup of patients suffering from chronic sepsis revealed that the use of albumin could be more beneficial. Nevertheless, there are prominent challenges associated with the use of subgroup analyses in drawing conclusions (3). The previous meta-analyses conducted to evaluate the albumin solutions’ effectiveness in resuscitation process have focused on patients with critical illnesses and patients with hypoalbuminemia and burns (4-9). There have been inadequate systematic reviews defining the most appropriate resuscitation fluid for different patients (4, 7, 9-12), and there is a lack of indications regarding the use of colloid or crystalloid. Thus, this study conducted a meta-analysis and systematic review with the aim of addressing the following question: Which fluid results in a lower mortality rate among different groups of patients with critical illnesses? This meta-analysis was performed in accordance with the so-called preferred reporting items for systematic reviews and meta-analyses (PRISMA) (13). Patients: patients with critical illnesses who need emergency treatment and care. Comparison: colloid fluids versus crystalloid fluids. Outcome: all-cause mortality at the available longest follow-up (including ICU and hospital mortality). We conducted a systematic search on Web of Science, BMJ Journals, Thieme, Index, Scopus, Google Scholar, and Path Consult up to April 2016. The search employed the following Medical Subject Headings or words: hypovolemic and plasma substitute patients, crystalloid fluids, colloid fluids, fluid therapy, and resuscitation in addition to suitable filters for randomized controlled trials. Additionally, we conducted a search on the relevant review articles’ bibliographies and the corresponding RCTs, which were searched through the Controlled Trials’ Meta-Register including experts to recognize unpublished trials, and Medical Editor Trials Amnesty. We experienced no restriction on language. The results obtained from the search were screened by a single author (SMH) in order to obtain the manuscripts of relevant articles. Two independent authors (AE and SMH) applied the so-called inclusion criteria to the eligible articles. The disagreements were resolved by either consulting a third reviewer (HR) or discussion. 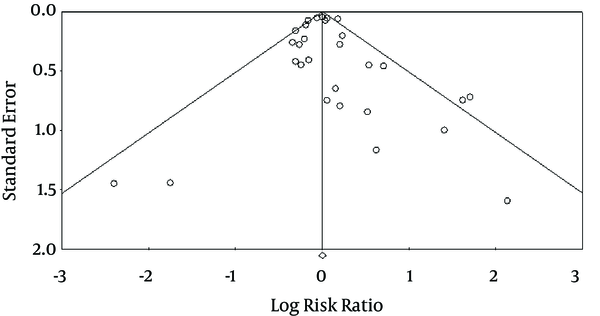 Two reviewers (AE and SMH) conducted an independent evaluation of each study’s methodological quality through the application of various items; assessing each trial through the method of allocation concealment, randomization, blinding, presenting an intention to treat analysis, as well as a loss to follow-up of ten percent of the primary outcomes patients. All-cause mortality was the major result in this study. In situations where mortality was presented at over one-time point, this study preferentially utilized the death at the longest follow-up time-point. We also contacted the authors whose studies lacked data regarding mortality rate and requested them to give us such data. We computed the so-called Pooled risk ratios for all-cause death using “Comprehensive Meta-Analysis (CMA)” 2.2.064 with 95% confidence intervals (CIs). We used the I2 statistics and chi-square to assess heterogeneity. We performed the assessment of the possibility for bias by inspecting Egger’s statistics and funnel plot. In this regard, this study utilized both fixed and random effects models. We applied the random-effects model only when an I2 statistics or chi-square value of greater than 50 percent was observed. The fixed effects model was applied in all other cases. P < 0.05 was regarded to be statistically significant. We developed monitoring boundaries in an attempt to determine if it was possible to terminate clinical trials when the p-value is far much less than the statistically significant P value. We were able to conduct such analysis in all cases because some of the studies had a small number of events. We then pooled the interaction term’s p-values by using the p-value’s meta-analysis. After performing the initial search, 2724 records were returned. Sixty-seven eligible studies were evaluated for inclusion based on the predefined inclusion criteria. The application of the inclusion criteria resulted in the inclusion of 26 studies (Figure 1). Such articles randomized 22,882 participants in order to receive colloid or crystalloid fluids. The studies’ features are depicted in Table 1. Out of the 67 possible eligible trials, 61 reported the mortality rate. We contacted the authors of the remaining 6 trials to provide us with the mortality rate regarding the 522 participants but we did not receive such data. Sixty-seven eligible studies were evaluated for inclusion based on the predefined inclusion criteria. 19 out of 67 potentially eligible studies were excluded since they were not RCTs, 10 studies were not associated with the use of colloid/crystalloid fluids, and six of them lacked data regarding mortality. Figure 1 provides detailed information regarding the articles that were prohibited. We analyzed the data of 26 trials that were finally involved in our review. Ten (38 percent) of the included studies were in sepsis (4, 5, 8, 17, 18, 23, 32, 34, 40, 41), two (7 percent) in ICU (22, 31), 3 (11 percent) in trauma (26, 28, 36), two (7 percent) in hypovolemic shock (14, 38), one (3 percent) in abdominal surgery (25), one (3 percent) in burn (16), one (3 percent) in pulmonary insufficiency (30), one (3 percent) in hypovolemic/septic (35), and five (22 percent) in other critically illnesses. NS was compared with HES in 6 (22 percent) of the included studies (16, 20, 23, 25, 31, 34), NS was compared with albumin in three studies (11 percent) (18, 19, 22), hypertonic saline was compared with dextran in three studies (11 percent) (28, 32, 37), albumin was examined along with non-albumin in two studies (7 percent) (27, 39), hypertonic dextran was compared with NS in one study (3 percent) (14), NS was compared with albumin/HES in one study (3 percent) (35) and other 10 studies (34 percent) compared different types of crystalloid versus colloid fluids. Bechir et al. study was conducted on severe burn injury patients (16); Alpar and Killampalli and Rackow et al. study dealt with patients in hypovolemic shock (14, 35). Uhlig et al. worked on the ARDS patients (7) and other studies included other critically ill patients. In fifteen of the trials, concealment of allocation was adequate. There was a low heterogeneity between trials (I2 = 39, df = 26, P = 0.020). The pooled RR of death for all patient groups was 1.001 (95%CI: 0.923 to 1.086). Two studies that contributed to 54% of the weight in the meta-analysis (22, 31) were of excellent methodological quality. The quality of all included studies is summarized in Table 2. The Cochrane risk of bias tool is shown in Table 2, whereby the risk of bias was assessed to be high, unclear, or low. The 26 RCTs provided data regarding all-cause mortality. There was a lack of evidence regarding the funnel plot’s inspection bias (Figure 2) even after the confirmation with the Egger’s statistic (p.65). Additionally, there was a lack of evidence of statistically significant heterogeneity by giving the I2 statistics of 39% and the P value = 0.020. The results obtained from Kendall’s test showed P value = 0.26 and tau = 0.15. The approximate value of the pooled RR regarding the death of patients resuscitated with the crystalloid fluid versus colloid fluid was 1.008 (95%CI: 9.964 - 1.054, p.726) (Figure 3). All the results obtained from included studies were pooled using a random effects model that gave the pooled RR of 1.003 for the mortality (95% CI 0.923 - 1.089, p.948). After the elimination of the first and second most weighted studies (22, 31), respectively), the approximate value of the pooled RR regarding the death of patients resuscitated with the crystalloid fluid versus colloid fluid was 1.009 (p.736) and 1.022 (1.074, p.375), respectively. There was no heterogeneity (I2 = 0) among studies reporting hypovolemic patients (14, 16, 28, 35, 36, 38), and statistical analysis showed a decrease in the mortality rate by using colloid fluids compared to crystalloid fluids (RR: 1.227, 95%CI: 0.932 to 1.614) (Figure 4). In the studies reporting the rate of mortality in ICU patients (22, 31), the analysis showed no difference between crystalloid and colloid in decreasing mortality rate (RR: 0.976, 95%CI: 0.911 to 1.046) (Figure 5), and there was a moderate heterogeneity (I2 = 46). In traumatic patients (28, 36), colloids decreased the mortality rate compared to crystalloids (RR 1⋅260, 95%CI: 0.857 to 1.852) (Figure 6) and there was no heterogeneity among these studies (I2 = 0). There was a significant heterogeneity (I2 = 67) among studies reporting septic patients (17-20, 23, 28, 29, 32, 34), and statistical analysis did not show a significant difference between colloids and crystalloids (RR: 1.03, 95%CI: 0.967 to 1.102) (Figure 7). Among studies using NS vs. albumin (18, 19, 22), statistical analysis showed that albumin significantly (P = 0.03) decreased the rate of mortality compared to NS (RR: 1.067, 95%CI: 1.004 to 1.134) (Figure 8). In studies using NS vs. HES (16, 20, 23, 25, 31, 34), analysis showed that NS significantly (P = 0.02) decreased the mortality rate compared to HES (RR 0.910, 95%CI: 0.837 to 0.989) (Figure 9) and no heterogeneity was reported among these studies (I2 = 0). Among the studies that used hypertonic saline vs. dextran (28, 32, 37), there was a low heterogeneity (I2 = 8), and statistical analysis showed that dextran decreased the mortality rate more efficiently than hypertonic saline with borderline significance (RR: 1.398, 95%CI: 0.974 to 2.006) (Figure 10). 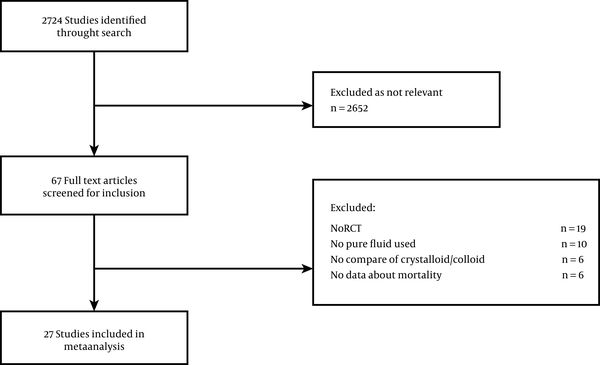 This meta-analysis and systematic review examined the correlation between the application of colloid and crystalloid resuscitation fluids. In this review, we included 26 trials consisting of 22,882 randomized patients for resuscitation. Generally, the trials only included the patients who were resuscitated using crystalloid or colloid fluids, while the studies’ methodological quality was variable. The previous meta-analyses (4-9, 11, 42) have evaluated the effect of colloid fluid regimens on the resuscitation of certain subgroups of septic patients. However, a few studies have focused on providing a comparison of the resuscitation of different categories of patients using resuscitation fluids. Before conducting this study, little evidence existed (18-20, 22, 24-26, 28, 32, 33, 35-39) indicating that colloids are better than crystalloids in intravascular volume resuscitation of patients with critical illnesses. To narrow this gap in literature, this meta-analysis revealed that colloids can reduce the mortality rate. For instance, in the comparison of dextran and hypertonic saline, the use of a colloid solution of dextran resulted in less number of deaths than the use of hypertonic saline. 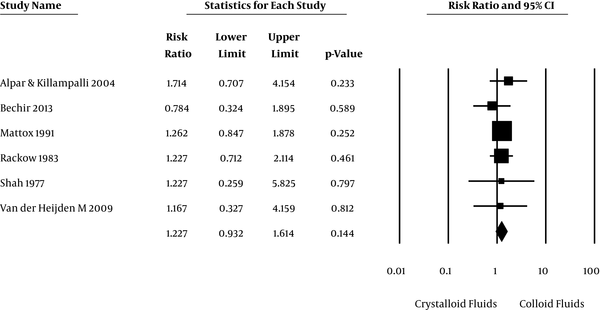 However, statistical analysis in the previous studies (16, 23, 31, 34) revealed that crystalloid solution (NS) is superior in reducing the mortality rate over HES; this is contrary to the studies conducted by Dubin et al. (20) and Harten et al. (25) and a meta-analysis by Perel et al. (33) revealing that lactated ringer/ NS has no priority over HES in mortality reduction. Our findings are consistent with those obtained in a meta-analysis by Delaney et al. (4) and some other studies (18, 19, 22), which revealed the superiority of albumin over NS in decreasing mortality. They were, however, inconsistent with the results of a study carried out by Myburgh et al. (31) which revealed that NS and albumin have the same impact in decreasing the mortality rate. This meta-analysis is in line with a systematic review by Schierhout and Roberts (12) indicating that the use of colloid fluids can result in a decline in mortality rate with borderline significance in both traumatic and hypovolemic patients. However, we observed no difference in septic and ICU admitted patients, contrary to a meta-analysis conducted by Xu et al. (8) showing that there is a significant decline in mortality (P = 0.003) when utilizing colloid fluid regimens in septic patients. Our study had some limitations. Just like all other meta-analyses, included patients and systematic features are incomparable and hence, the computation of summary effect measures is questionable. Different trials used different resuscitation regimens. 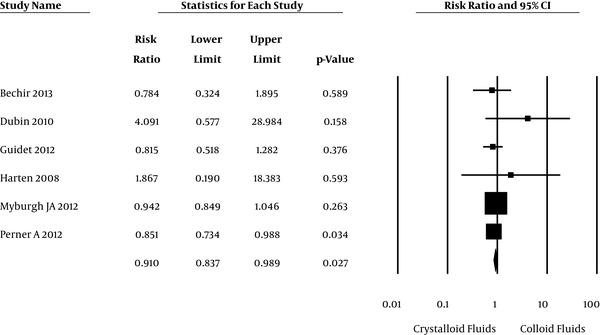 The studies’ methodological quality was variable and some of the trials randomized their participants by the crystalloid and/or colloid fluids. In addition, the quantity, concentration, and type of fluid varied from a study to another. Moreover, all the patients that were examined in the meta-analyses required volume replacement; hence, such variation in the requisite intervention would affect the effect’s size instead of the effect’s direction. Just like all other meta-analyses, the reliability of the results obtained from the pooled analysis is limited to the results obtained from the included studies. Generally, the included studies’ methodological quality was not optimal. Particularly, a number of commentators noted that it is incorrect to incorporate the effect estimates obtained from studies that are based on different colloids. For instance, the commentators argued that colloids with large molecular weights like HES can be retained better in the vascular compartment than gelatins and albumin and hence, they are more likely to reveal a favorable impact on the mortality rate. The major limitation with making conclusions in such a form of meta-analysis is that the entire studies included in this meta-analysis were conducted on patients suffering from severe diseases without conducting subgroup analysis. At the same time, the results of this meta-analysis differ from those obtained in previous meta-analysis studies (4-9, 11, 42). The results of this analysis are doubtable and further confirmation is required by using better RCTs. The meta-analysis results can be refuted by conducting suitable randomized controlled trials. There is also a need for further research before making definitive recommendations on the optimal selection of the resuscitation fluid for each subgroup of patients. 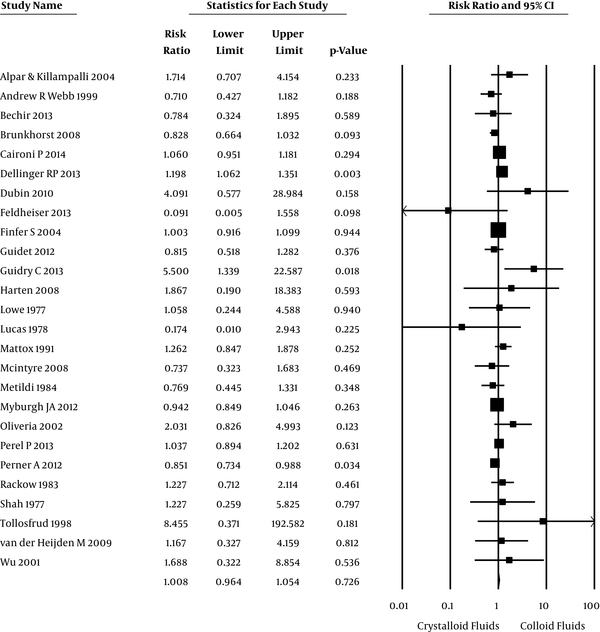 In this meta-analysis, the pooled RR for mortality was 1.01 when using albumin (95% confidence interval: 0.93 - 1.10). The two studies that accounted for 59% of the total weight in this meta-analysis have been conducted by Finfer et al. and Myburgh et al. (22, 31), which have a low risk of bias and high methodological quality. Currently, randomized trials are being carried out on colloid versus crystalloid fluid resuscitation. A study comparing crystalloids versus colloids during surgery (NCT00517127) is planned to enroll 1112 patients and expected to finish by Feb 2017. In addition, a study on the effects of colloid and crystalloid on microcirculatory alterations during off-pump coronary artery bypass surgery (NCT01713166) has completed the enrollment of 120 patients in June 2016. 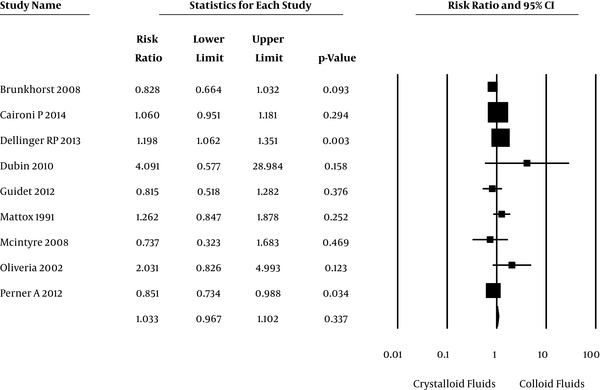 The results of this meta-analysis show that in traumatic and hypovolemic patients, colloid fluids increase successful resuscitation rate compared to crystalloid fluids. Some of the colloids like albumin and dextran have a positive effect on reducing the mortality rate but others like HES increases this rate compared to NS. We thank Dr Mohammad Bahadoram for his help in this work. Financial Disclosure: We have no financial interests related to the material in the manuscript. Conflict of Interests: My coauthors and I submit the enclosed manuscript, “Fluid resuscitation, which fluid is the best for each patient? (a systematic review and Meta Analysis)”. We declare that there is no conflict of interests, and my coauthors and I accept the paper publication. Dr. Seyed Mohammad Heshmati; Dr. Ali Ebrahimi, Mr. Hamid Reza Rasouli.